What took away all the attention from the protests was the walk which Trump and Queen Elizabeth II shared. 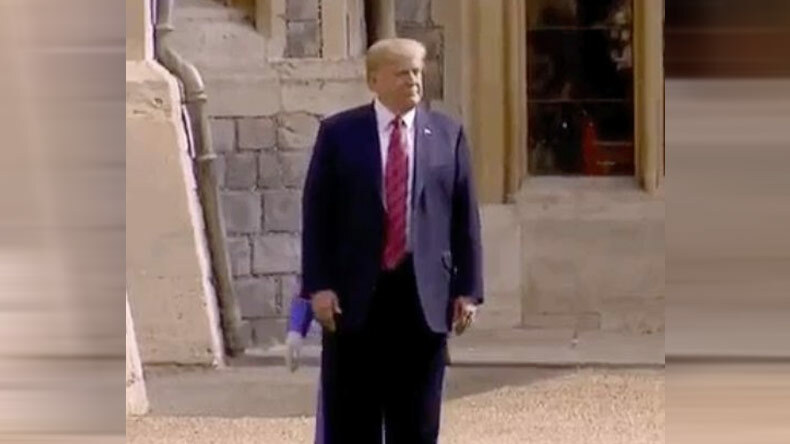 While inspecting the guardsmen and touring the grounds of the castle, Trump was seen walking ahead of the Queen that made her little uncomfortable. US President Donald Trump’s four-day working visit to England to meet British Prime Minister Theresa May resulted in massive protests with thousands of people taking to the street and mocking Donald Trump. Apart from improving relations between the two nations, Donald Trump also provided us with thousands of memes. During his visit, Trump was spotted sharing a walk with May right before the joint press briefing. However, what made the headlines was how Donald Trump upstaged the Queen of England, Queen Elizabeth II. During his controversial visit to the UK, Trump met Queen Elizabeth II on Friday at Windsor Castle. While the preparations were being done to welcome Donald Trump, thousands took out ‘Stop Trump’ rally in London’s Trafalgar Square. On Friday, a chaos was noticed after people protested against the US President’s presence in the country. However, what took away all the attention from the protests was the walk which Trump and Queen Elizabeth II shared. While inspecting the guardsmen and touring the grounds of the castle, Trump was seen walking ahead of the Queen that made her little uncomfortable. Even though Queen didn’t complain about it much but the netizens just failed to hold in their anger and slammed Trump over his ‘rude’ gesture. While some were left in shock, some questioned Trump that how he dare to walk ahead of Queen Elizabeth II. Later, the editor of Royal Central, Charlie Proctor also mocked the situation by sharing a series of photographs showing how previous US Presidents were greeted by the Queen of England. In one of the photographs, based on the current visit, Trump was seen overshadowing the Queen. Apart from this, Donald Trump was also criticised for being late at his meet with the Queen. The 92-year-old queen was seen waiting for hours before Trump arrived for the meeting. Queen was also spotted looking at the watch in Trump’s absence.